The Americans with Disabilities Act (ADA), sets standards for making business websites accessible to people with disabilities. Any company that deals with persons with disabilities must ensure that their websites are accessbile to their users at all times. 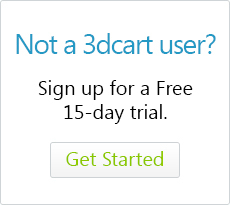 Unfortunately, 3dcart is not directly ADA compliant by default. However, there are steps you can take on your store's design and layout to make it ADA compliant. Please click on our featured blog article: "How to make your website ADA compliant" for more information.